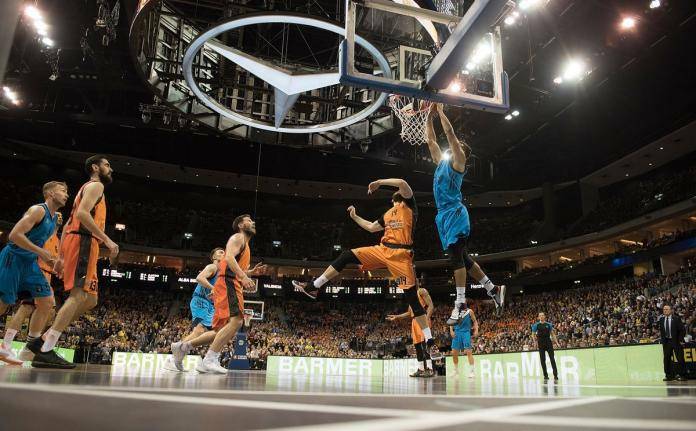 ALBA Berlin stepped up in Game 2 and defeated Valencia at home in overtime (95-92), forcing a Game 3 in the EuroCup Finals. Even though the visitors had the lead, with three minutes to go (66-71), the hosts saw Peyton Siva turn things around and force an overtime (83-83). In the extra period, the Germans were in front by six (89-83), but the Spaniards cut the deficit to one, 54 seconds before the end of the game (93-92). Luke Sikma sealed the deal for ALBA, though, with a pair of free throws, as Matt Thomas missed the game-tying three-pointer at the buzzer. Four players scored in double figures for the winners, with Rokas Giedraitis having a team-high 17 points. Sam Van Rossom (22 points), Fernando San Emeterio (16 points) and Will Thomas (15 points) were the best players of the losing squad. Game 3 will be played in Spain on Monday (15/04). The winner will claim the title and will secure its spot to the 2019/20 EuroLeague.
.@albaberlin had to win to stay alive against @valenciabasket in the #7DAYSEuroCup Finals!